Before Jordan Spieth’s press conference at Chambers Bay in University Place, Washington, a USGA official reeled off some historical context for Spieth’s win. Bobby Jones won all four majors in 1930, including the U.S. Amateur and British Amateur, several years before he created the Masters. Spieth’s major wins represent the most impressive achievement in golf since Tiger Woods was setting records a decade ago. That the achieving is being done by a likable young superstar who considers himself a “golf historian” and is now poised to rival Rory McIlroy, the game’s other likable young superstar, for at least the next decade should have made this weekend at least a small triumph for the sport. But it wasn’t. The immediate feeling in the aftermath of the event was that Dustin Johnson had lost, not that Spieth had won. And an almost great, kind of disastrous U.S. Open got itself an ending befitting the week that had preceded it. Chambers Bay took a lot of flack over the weekend from golfers and the media alike. Most of the greens were bumpy as two competing grasses took root on the surfaces and responded poorly to dry conditions in the run-up to the tournament. The three reseeded greens on 7, 10, and 13 that played beautifully only made things worse; they forced players to reset their touch, as the feel was so different, and they represented a what-if for the venue that hung over the proceedings all weekend long. Also, the layout of the course, a municipal that was not designed to host the number of people who came out for the U.S. Open’s first trip to the Pacific Northwest, made the event a struggle for the fans. It was near impossible to follow a group as they made the turn, and the eighth hole had no viewing areas at all. The course’s hills, which made it a golf challenge worthy of a U.S. Open, also made it an endurance test for spectators and participants alike. Two caddies were injured and Jason Day suffered from a bout of benign vertigo that he somehow overcame to finish in the top 10. And yet it was a historically great course in other ways. The views rival Pebble Beach’s. The tee-to-green challenge was unique yet demanding, with rolling fairways and massive bunkers creating a fascinating set of opportunities and obstacles on the bulk of the par 4s. And the ability to alternate the pars of the first and 18th holes between 4 and 5 meant that USGA executive director Mike Davis could set up the final hole of the event for maximum drama. For Dustin Johnson, it’d been a rough 12 months leading up to that final hole. While his game is in great shape right now, he’s coming off of a year that saw him take a significant suspension for personal reasons (alleged to be related to recreational drug use). Johnson also has a rough history in majors, having lost the 2010 PGA Championship for grounding his club in a bunker despite the bunker itself appearing to simply be part of the rough. 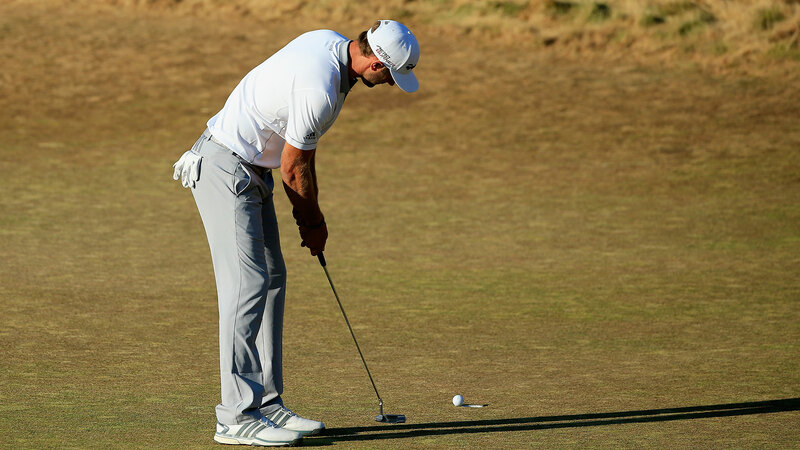 All weekend long, Johnson controlled a Chambers Bay course that stymied the bulk of the field. While his putting touch came and went as everyone’s did on the bumpy greens, his length off the tee and his accuracy meant that he was giving himself opportunities to score and then taking them all week long. While Jordan Spieth was dropping 20-foot putts like the greens had been manicured for Augusta National, Johnson was simply getting the ball close and taking the bulk of his opportunities. Nobody played the course as true to the setup as he did. So when nerves struck the supposedly unflappable Johnson (a reputation he has gained mostly due to his personality rather than his results) on holes 10 through 13, it felt like an unfortunate end of a great run. However, on the heels of Spieth firing a double bogey, Johnson tied things up with a birdie on 17, opening up the chance to win the tournament on 18. While eagling the 18th at a U.S. Open is usually impossible, wind conditions led the USGA to set up 18 as a par 5 that was reachable in two. With a perfect tee shot and iron in to 12 feet, Johnson did just that. After a Spieth birdie, one putt and the trophy would be Johnson’s. Two putts and he would force a playoff. That Johnson missed the eagle putt was perhaps to be expected. Twelve-footers hadn’t dropped all weekend, and this was a touchy putt on a lightning-fast green. He pushed his putt a little past the hole, leaving himself 3 feet for birdie and an 18-hole playoff with Spieth. It was little more than a formality. Except, on the greens at Chambers Bay, nothing is a formality, and of course, Johnson missed. Did the ball bounce on the historically uneven greens? Had Johnson misread the putt? Had Johnson just choked? The questions hung in the gallery as the trophy was brought out and presented to Spieth, who called the moment “utterly shocking.” Spieth had made history, but the air had been sucked out of the gallery. This was a staggering historical achievement staged as a gut punch. Spike Friedman is a writer based in Seattle, Washington. Follow him at @spikefriedman. This post has been updated to reflect that Ben Hogan, not Bobby Jones, also won the U.S. Open and the Masters in the same year.